Now that Microsoft has killed any hope for more Android phone from Nokia, the companies can focus on making more Lumia handsets - like the rumored Nokia Lumia 830. 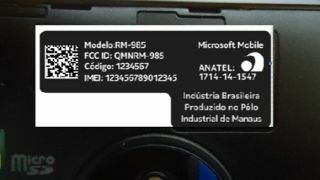 The Lumia 830 hasn't been officially announced, but it apparently has gone through certification in at least one country, if these photos and details from Brazil (via Windows Phone Central) are legit. Like the Federal Communications Commission in the US, Brazil's Anatel certifies phones that come into the country, and just like the FCC, Anatel also occasionally spills the beans about them. These photos match up fairly well with the alleged Lumia 830 images that appeared in July, although that metallic-looking frame is looking decidedly more plastic in these shots. Based on what Anatel published, it seems the Nokia Lumia 830 may be thinner than past Lumia phones and have a physical camera button and hardware-based capacitive navigation buttons, and that the charging port has been moved back up on top next to the headphone jack. In addition it's interesting that the 830 may carry the Microsoft Mobile label internally, though it will likely still be a Nokia phone as far as the public is concerned. This leak also outs the Lumia 830's removable battery and microSD slot, as well as its fairly large camera housing, suggesting some form of Nokia's PureView tech will make it in here too. All in all the Lumia 830 is looking like a strange mix of mid- and upper-range specs and features, though until it's officially unveiled we won't know how to categorize it for sure. But this being the second Lumia 830 leak in less than two months, it seems a full announcement may indeed be coming soon. Hm, Microsoft is hosting an event prior to IFA 2014 - think there could be any connection?